I have a love/hate relationship with Japanese animation. I don’t think I need to explain the love part but the hate part is for the same reason that I disliked Mary Poppins and The Wizard of Oz. It seems that as a viewer you can be tracking along just fine, but at some point in time, the movie requires you to believe that the characters being in a drug-like state of intense colours , surreal environments and dancing creatures is a perfectly natural progression. Dream-like sequences for me have become less and less of a valid storytelling tool. So it was with some scepticism that I entered the world of A Letter to Momo. The movie is about a girl named Momo whose father has just died. Moving with her mother to a rural village for a chance at a new start, Momo is a haunted by the fact that the last interaction she had with her father was an argument. She carries with her a letter that her father started writing to her after the fact but never finished. All seems rather dull and sleepy in the new village until Momo discovers three goblins living in the house. It was at this point in the movie that I started getting nervous. The three goblins from the outset resemble the kind of creatures that I tend to dislike seeing in movies. They’re slapstick and just outright bizarre. The large ogre-looking one named Iwa has a mouth that never closes even when he’s talking or eating. Kawa the frog-like one resembles a mutant Buddha and Mame the tiny, forgetful one looks like Gollum and E.T. had a baby. But – and this is a huge “but” – to my surprise, I did end up loving them. After her initial terror at seeing such freaky things in her house, Momo’s interactions with the goblins are hilarious and absolutely relatable. Having discovered that they have a tendency towards chaos and eating everything in sight, Momo suddenly finds herself in the worst babysitting job ever as she tries to keep the goblins from upsetting the entire village. There are slapstick moments but there is also a slew of subtle humour that made me realize what a gem the characters actually are. When Momo discovers that the goblins have the key to deciphering the rest of her father’s incomplete letter, things take a turn, but in an even better way. What was just a charming story before becomes an insightful look at how different people deal with grief. This was the initial concept that the director Hiroyuki Okiura wanted to explore and he does it extremely well, goblins and all. Aside from the storyline itself, I was struck by the way that the animators managed to portray humans that was so familiar to me. 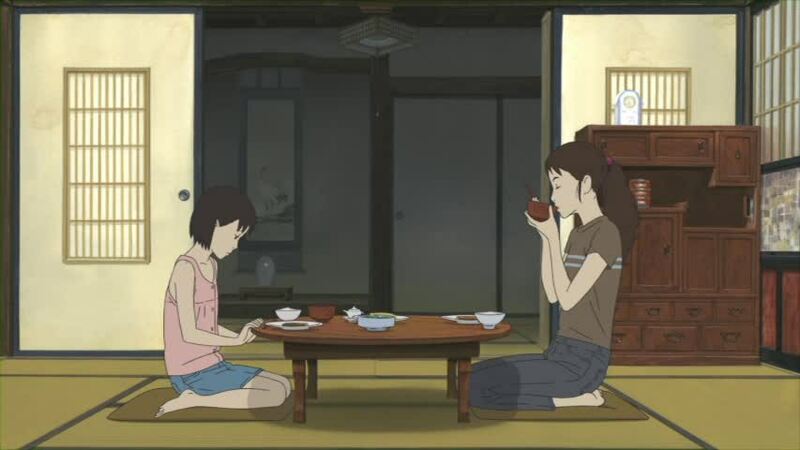 Being from an Asian family, I was delighted to see little mannerisms of an Asian household captured so well on screen, from the way that Momo cools herself by having the fan blow under her shirt to the meticulous way that her mother Ikuko takes off her shoes before entering the house. It was also beautiful to see how well the animators had found a fine balance between realistic imagery versus painting – a quality that Okiura admits that he was striving for. So if it wasn’t clear before, I’m glad to say that my misgivings were well misplaced. I found A Letter to Momo is as charming and well-thought out as the number of awards it’s been given suggests. I hope you’ll experience the same.